This website was created by The Pillow With A Hole Ltd at the behest of our customers. It is our hope that through education and the application of The Original Pillow with a Hole™, people suffering from CNH or ear pressure sores will finally be able to sleep peacefully and pain free. Or you can read about CNH below. We know you’re in pain, but you’re not alone and the solution is at hand. Worry not and read on. What is Chondrodermatitis nodularis chronica helicis (CNH)? 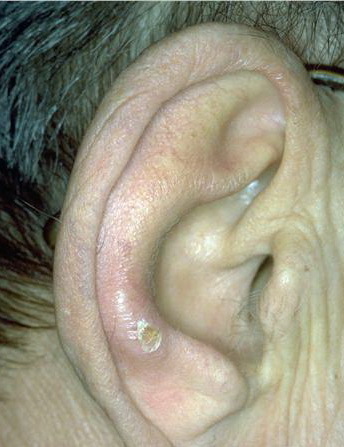 Chondrodermatitis nodularis helicis (CNH) presents itself as a painful skin coloured lesion on the helix or antihelix of the ear. CNH can affect anyone at any age however the majority of studies show that it mainly affects those within the 50 to 80-year-old age group. Various treatments have been tried, including surgical techniques, laser therapy, corticosteroid creams and pressure relieving pillows. The good news is that the main aim of treatment is to reduce pain and ultimately cure the condition. Recently there have been new therapies outlined for Chondrodermatitis with excellent results. The gallery opposite shows CNH on both the helix and antehelix. To see them click the slider on either side of the image. 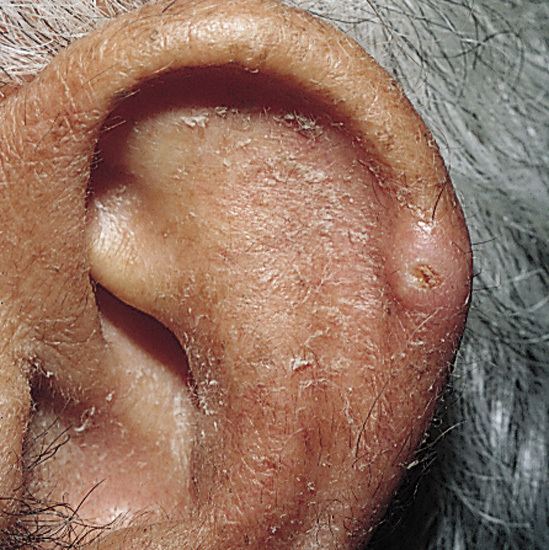 Chondrodermatitis nodularis helicis (CNH) was first discovered and described by Winkler just over 100 years ago, hence its alternative name of Winkler’s Disease. It is, as described above, notable for its painful skin coloured lesions on the ear. Also notable is the accompanying overlay of scale or crust. Both sexes are affected. While men most commonly have lesions on the helix, women tend to have lesions mainly on the antihelix. This is evident in the images below. How people develop CNH remains uncertain. The most compelling theory, and the one that correlates with what we have personally observed, is that continual pressure on the ear leads to a loss of blood flow to the cartilage. This causes the cartilage to break down and degrade, leading to a painful pressure sore. Other causes include trauma, cold temperature, collagen defects, and autoimmune disease. Diagnosis is usually made on the spot by your doctor, but since Chondrodermatitis looks a lot like skin cancer, a biopsy may be performed. While the cheapest and most effective method of treatment for CNH has been to remove the pressure from the ear, there have been some interesting treatments developed over the last few years. Let’s examine them. When the last clinical review of CNH was carried out, various treatments were available. These included including pressure relieving methods, surgical excision, lasers, injectable corticosteroids and topical corticosteroids. More recently, however, there have been new invasive and noninvasive treatments which your doctor may offer you. Let’s take a look to discover what’s best. Pressure relief is by far the simplest solution. A pillow with a hole alleviates the pressure on the ear and allows it to heal. A recent Travelute study showed that out of 18 patients that used a pressure relief pillow, after failing previous treatments with NSAIDs, intralesional steroids, nitroglycerin ointment, and surgical excision, 91.7% of them experienced a significant improvement in their condition. The best thing about relieving the pressure is the fact that it addresses the root cause of the problem rather than simply treating the symptoms. 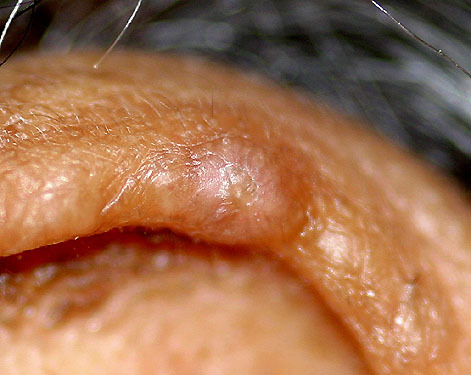 Wedge excision has been the most commonly used surgical technique to treat Chondrodermatitis. Yet, in recent years, new techniques have been developed with the aim of minimising recurrence and improving results. New kinds of excision are ‘the triangular window technique’ which when compared to wedge excision technique avoids the canoe shape hole that often results from wedge excision. It also decreases the chance of developing two new CNH lesions at the ends of the excision. 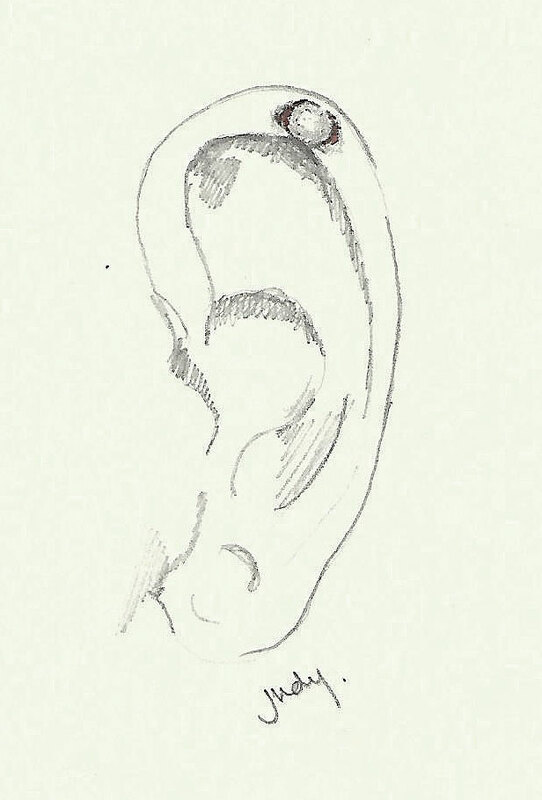 ‘Retroauricular excision’ is similar to the triangular window technique and focuses on minimising recurrence and concealing the scar, making it a preferable technique. Although unfortunately it only works on Chondrodermatitis that affects the Helix. The most popular non-surgical treatment for CNH has been corticosteroid creams. 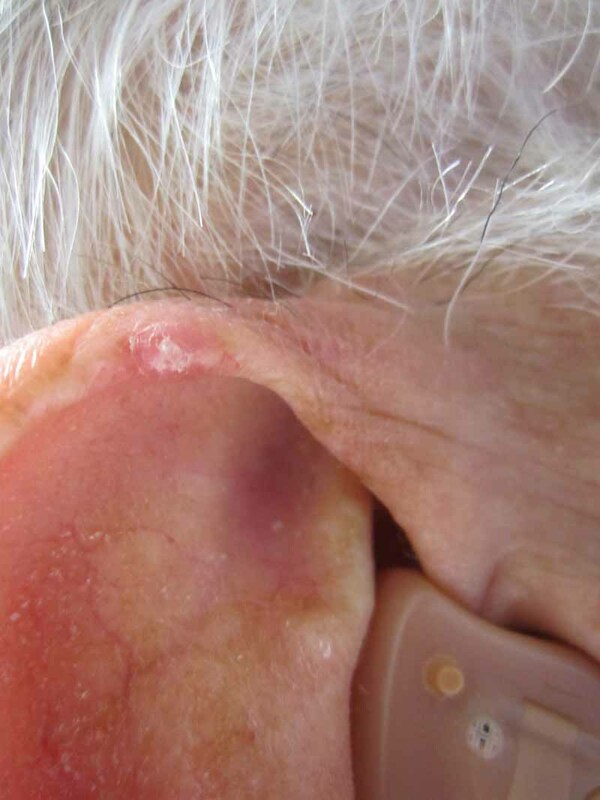 A 2011 study of 15 CNH sufferers that were prescribed 2% nitroglycerin cream showed that it can be quite effective, although it and many other treatments don’t address the root cause of the problem – pressure on the ear. 13 lesions in 12 patients were studied. Eight of the lesions cleared up completely, while four had partial clearance. Two of the patients reported side effects during treatment such as headaches or dizziness. After reducing the dose to 1% nitroglycerin all side effects disappeared. One of the newest treatments for Chondrodermatitis is photodynamic therapy, known as PDT. Essentially light of a certain wavelength is shone on CNH lesions after they have been prepared with various creams and ointments. There are apparently few side effects and the results are promising. Of the people that underwent the procedure, all of their lesions resolved except for one. This took three treatments each spaced four weeks apart. CNH is a frustrating condition to suffer from. It often requires a long-term therapy commitment, gets in the way of sleep, can become costly when it hangs around for a long time and can recur in up to 34% of patients. When addressing your CNH you will of course want to consider cost. For this reason many doctors, and this website, recommend you get a pressure relieving pillow with a hole. They are by far the cheapest, safest and most effective way of treating CNH but while this is all true, comfort plays a large role. If you’re not comfortable on your pillow you will not use it and it’ll never get a chance to heal. Therefore choosing the right pillow is of utmost importance. As stated previously; this website was created by the makers of The Original Pillow with a Hole™ to give people a sense of what options are out there for them. After to speaking with hundreds of sufferers over the years it is evident to us that many doctors don’t know that the most effective treatment is removing the pressure from the ear. Your pillow is the cause of CNH – your pillow can also be the cure. Yet creams and ointments seem to be routinely prescribed instead. This does little to address the root cause of the problem and our customers are left suffering. Therefore we recommend you take a look at our website here: https://thepillowwithahole.co.uk/ to see what we can do for you. Leave a comment below if you have been affected by CNH or related ear conditions. People would not doubt like to hear your story.